When I posted a delicious juicing recipe, many of you said you wanted to add more fruits & vegetables to your diet. An easy way to do that is to go to a local farmer's market - the fruits & vegetables that are in season will be there for a decent price. Having healthy fruits and vegetables in your diet is very important...it helps prevent: heart disease, strokes, diverticulitis, some types of cancer; and controls your blood pressure and protects you against cataract degeneration or vision loss. 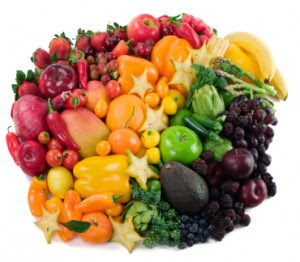 Every fruit & vegetable is full of different essential vitamins and minerals - especially depending on the color. It is important to consume as many different fruits and vegetables of various colors. There are so many ways to add these fruits and vegetables to your diet - delicious recipes, along with juicing! Add as many of these fruits and vegetables to your diet as possible! -Starting NOW...GO! GREAT picture of fruits&veggies! Makes them look so pretty! I have actually joined a CSA the past 2 years and am renewing this year as well. Great source for veggies, known and new! I love the farmers markets by me too. They are getting really yummy now that food is starting to be 'in season'! I just bought my first strawberries of the season last week, YUM! Thank for entering my giveaway, I love your blog! I just got Strawberries and Asparagus this weekend at the grocery! So delicious! Oooh, I love all of the fruits and veggies in season right now! Avocados, pineapple, strawberries, asparagus... YUM!!! Love the farmers market!!! And I love spring/summer season for fruits and veggies. So much more fresh stuff. that picture looks so colorful!